In accepting both the chaos of history and the fact of my total end, I was freed to truly consider how I wished to live - specifically, how do I live free in this black body? It is a profound question because America understands itself as God's handiwork, but the black body is the clearest evidence that America is the work of men. Ta-Nehisi Coates' letter to his son, published as the book Between the World and Me has justifiably garnered a lot of attention since its publication. As Americans struggle to understand their racial legacy, Coates' book provides us with a glimpse of what it was like for him to grow up Black. For that reason alone, I think as many Americans as possible should read this book. I am lucky enough to have a diverse group of friends with whom I can frankly and honestly discuss race and gender issues. I realize that many people do not have that luxury, which is yet another reason why reading diversely is so important. Between the World and Me offers those people with an idea of just how terrifying it can be to be Black here. And it serves as a reminder to everyone that fear runs both ways. As frightened as a middle-class white man can be to see a black guy walking the streets of his neighborhood, it's pretty much guaranteed that the black guy feels just as frightened, except add in the fact that he probably doesn't trust the police to protect him, either. There are so many parts of this book that made me so very sad. Coates is such an emotionally charged author. He pushes you and challenges you, and it was such a good lesson. Soon after finishing this book, I took a trip to Charleston, SC, and I think because the stories were so fresh in my mind, I found myself constantly telling myself and my friend, "Do not forget that these beautiful houses were built by slave labor. Do not forget, do not forget, do not forget." Of course, it's easier to remind yourself when you are a Northerner visiting the South, as Northerners love to think we have some sort of moral superiority to the South. We like to forget so much of our own horrifying history. Or the fact that when half the country uses slave labor, the entire country benefits from slave labor. I hope that all my reading about the black experience in America will help me to flush out my own biases, and constantly remind myself that my experience of America is not universal. I have no desire to make you "tough" or "street," perhaps because any "toughness" I garnered came reluctantly. I think I was always, somehow, aware of the price. I think I somehow knew that that third of my brain should have been concerned with more beautiful things. I think I felt that something out there, some force, nameless and vast, had robbed me of ... what? Time? experience? I think you know something of what that third could have done, and I think that is why you may feel the need for escape even more than I did. You have seen all the wonderful life up above the tree-line, yet you understand that there is no real distance between you and Trayvon Martin, and thus Trayvon Martin must terrify you in a way that he could never terrify me. You have seen so much more of all that is lost when they destroy your body. That one had me in tears, really. The possibility of a life well-lived, lifelong friends, the potential and opportunity to do something extraordinary, so much of that passes through Chicago schools every day, and so much of it is lost to horrible schools, violence, and issues at home. Think of all the amazing, brilliant, artistic, world-changing people that our country has lost. You may have heard the talk of diversity, sensitivity training, and body cameras. These are all fine and applicable, but they understate the task and allow the citizens of this country to pretend that there is real distance between their own attitudes and those of the ones appointed to protect them. The truth is that the police reflect America in all of its will and fear, and whatever we might make of this country's criminal justice policy, it cannot be said that it was imposed by a repressive minority. 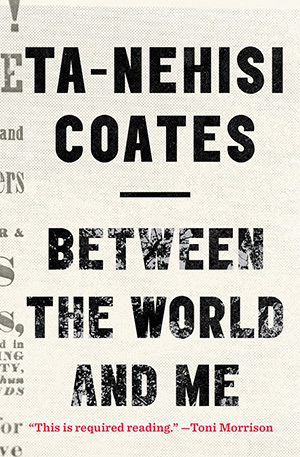 Many times in this book, Coates reiterates the point that no matter how successful, how polite, how friendly, how un-confrontational a black man can be in every moment of his life, it can all fall apart so quickly and so easily because someone else can just see you and feel frightened and take action. Many people move out of unsafe neighborhoods as quickly as they can, put their kids into excellent schools as early as they can, give them experiences and gifts that expand their minds in hopes of helping them become good, successful, happy people. But black men have to work so much harder for that to happen, and the possibility that it can all be taken away is ever-present. "And one racist act. It's all it takes." What an amazing review, Aarti! I have a copy of this and your review makes me want to read this really soon. Wow! This book sounds amazing. I definitely need to get my hands on a copy of it ASAP! I loved those passages you shared. A definite must-read for all. Great review. I hope to read this one soon. I highlighted so many passages in this book it was ridiculous. I had to seriously narrow things down to decide what I was going to actually write down in my commonplace book. (This time! I'm sure on a reread, I'll have more things to write down.) One thing that really really stood out to me was the part where Coates wonders whether he could assert power over someone else's body, or if he already has in his life. I don't know. That really got me. We end up part of a bad system even when we don't want to be. Similar to Jenny, I highlighted many many passages in this book. Coates offers a bracing, challenging perspective on race. He used some powerful motifs throughout: the black body, the Dream, people who believe themselves to be white. I would like to re-read it, to better contemplate it. My copy of the book had to go back to the library half-read. But the pages I read... were beautiful! Everyone seriously needs to read this book, it is just fascinating.